I thought, it didn’t make much sense. Driving two hours each way for a 45 minute long walk! 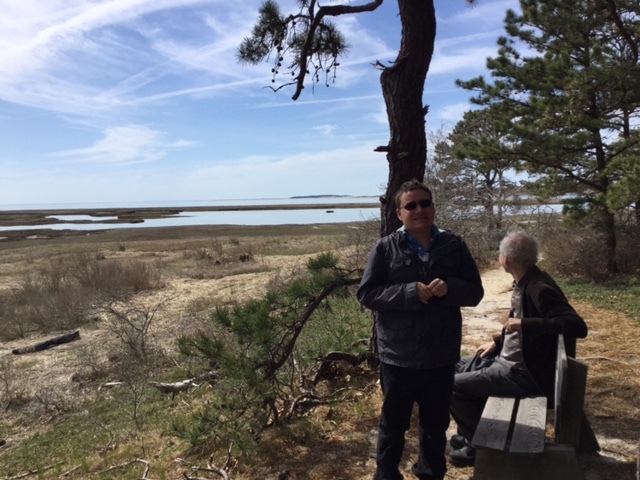 But then, we haven’t been in Wellfleet’s Bay Wildlife Sanctuary for almost 10 months and we heard its nostalgic calling. All of us. “Ocean, Ocean” Robert kept repeating. “Audubon, Audubon” Robert confirmed his choice in his distorted speech that squeezed each word into one strange syllable. So we went. we stopped on the way in Burger King. As Robert finished his meal, he started screaming. I didn’t know why he was screaming, but I regretted our excursion. He patted his cheeks, freezing in place from time to time and he screamed. That didn’t last long, but Jan and I were momentarily paralyzed. Robert screams always hurt. They hurt double because we believe that Robert is also hurting. with a lot of patience Jan encouraged Robert to get into the car. We thought for a 30 seconds what to do and we decided to continue driving to Wellfleet. Robert was calm, although I noticed somewhat different breathing pattern. He was holding air a little longer than usually and then exhaled with some effort. It seemed that acid reflux was at fault. I worried. But then, there was the Sanctuary. The air got warmer and we could take our jackets off. There was balsamic smell of pines. There was this silence that became a backdrop to birds songs. There was the air devoid of any allergens. We passed only one group of elderly visitors who stopped to decide which way to go. There were parts of the forest destroyed by water and wind from severe storms or hurricanes. There was resigned silence of passing. There were parts of the forest untouched by strong forces of nature breathing calmly their expectation for a better summer. There was a view of dunes sticking out of the water. It was a high tide and the boardwalk was submerged. We took a few minutes to look at the vast, open space of the bay before deciding to turn into Goose Pond Trail. We walked carrying our jackets through the stillness of the warm afternoon.We didn’t break the tranquility of that walk with any unnecessary sound. The following week, we asked Robert where he wanted to go for a walk. We gave him a few options. So we drove two hours again and again Robert screamed after the meal in Burger King. And then there was the Sanctuary. We chose different trail, and Robert was fine with it. He walked mostly ahead of us, but kept coming back for his dad who stayed behind or waiting for me lagging after both of them. We stopped many times to look at the Bay and a few times to take pictures. But mostly we breathed and walked, letting the air infuse our bodies and permeate our souls.